(Updated 6 a.m. EDT) -- Start saying goodbye to single-use plastics on cruise ships. A handful of lines have either eliminated straws or other single-use plastics, or pledged to ban all single-use plastics in the near future. MSC Cruises: MSC is phasing out all single-use plastic straws by December 2018 with a further pledge to remove virtually all single-use plastics across the fleet by March 2019. Carnival Cruise Line: The line has stopped placing plastic straws in glasses when drinks are ordered. "We will no longer automatically serve any soda or cocktail (except frozen) with a plastic straw," Carnival's brand ambassador John Heald said on his Facebook page in April. "They will be provided by request. If you want one, please ask. Please support our efforts to limit the amount of plastic that can be found in the seas today." Cruise & Maritime Voyages (CMV): CMV is no longer supplying straws with drinks. Notices have been put up at bars stating: "In the interest of protecting the environment, please be advised that plastic straws will not be served with drinks from the bars. Should you require one please ask your server." Norwegian Cruise Line: Plastic straws officially have been banned across Norwegian Cruise Line's fleet, as well as on its privately operated ports: Great Stirrup Cay, Bahamas, and Harvest Caye, Belize. The company is working toward several other environmental efforts, including sustainable sourcing, minimizing waste to landfills and reducing CO2 emissions. Oceania Cruises: Through its parent company, Norwegian Cruise Line Holdings Ltd., Oceania has eliminated all plastic straws from its ships. Regent Seven Seas Cruises: Also under the Norwegian Cruise Line Holdings Ltd. umbrella, luxury line Regent has stopped using plastic straws onboard. Seabourn: Luxury line Seabourn has stopped using plastic lids on disposable coffee cups, while plastic straws are only available upon request (lids also can be requested). It plans to eventually eliminate single-use plastics across its fleet. Azamara Club Cruises: Plastic straws are no longer provided unless especially requested. 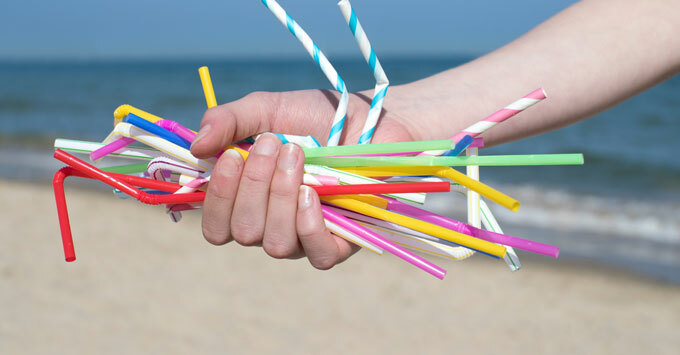 The line plans to eventually ban all single-use plastics -- an initiative spearheaded by its parent company, Royal Caribbean Cruises Ltd.
P&O Cruises Australia: Carnival's sister brand, P&O Cruises, also has removed plastic straws from its Australia-based ships. "Bar staff are becoming accustomed to the recently introduced change in which straws are only provided at a guest’s specific request or where a frozen drink requires it," a spokesperson said. "Guests have embraced the change and have given crew positive feedback. Few guests now ask for straws." Uniworld Boutique River Cruise Collection: Luxury river cruise operator Uniworld has gone one step further to eliminate not only straws, but also other single-use plastics such as water bottles. The line also has made significant strides in reducing paper waste. Lindblad Expeditions: The expedition cruise company co-operated by National Geographic officially has banned all single-use plastics -- including cups, straws and stirrers -- across its fleet. Plastic water bottles have been banned on its ships since 2007; the line provides passengers with reusable stainless-steel bottles that may be refilled at various filtered-water stations onboard. AmaWaterways: River cruise line AmaWaterways has replaced all plastic straws with paper straws across its fleet. Captain Cook Cruises: With a goal to remove as many single-use plastics as possible from its small Fiji-based ship, Reef Endeavour, the cruise line has banned all plastic straws; recyclable paper straws are available for certain drinks. Plastic cups will be replaced by reusable cups, and the line will recycle all water bottles back to its supplier. Virgin Voyages: The new cruise line developed by business mogul Sir Richard Branson, which will debut with its first ship in 2021, said it will not have single-use plastics onboard -- including straws, bottled water, other beverage bottles, condiment packets, shopping bags, food packaging, stirrers, and take-away coffee and tea cups. It also will emphasize the use of sustainable materials. Royal Caribbean: Royal Caribbean has pledged to ban single-use plastic across its fleet, but did not indicate when the policy might go into effect. Celebrity Cruises: Royal Caribbean's sister brand will eliminate single-use plastics through the same initiative. Disney Cruise Line: By mid-2019, Disney will have eliminated all plastic straws and plastic stirrers on its ships. Additionally, the line aims to reduce plastics in its passenger cabins by 80 percent, by transitioning to refillable amenities, over the next few years. Cunard: In early February, Carnival Corp. UK brand Cunard pledged to abolish all single-use plastics -- including straws, water bottles and food packaging -- from its ships by 2022. P&O Cruises: The remainder of P&O Cruises' fleet also revealed in February it would enforce a single-use plastic ban by 2022. Peregrine Adventures: The small-ship cruise line recently revealed it plans to ban all single-use plastics from its exclusive charter cruises. It also will provide refillable water bottles to its passengers, in lieu of plastic water bottles. G Adventures: The adventure tour operator said as of January 1, 2019, its four Galapagos-based small ships would enforce the use of reusable water bottles -- citing a ban on "non-returnable bottles" by the Galapagos Council, that reportedly will go into effect in February 2019. G Adventures previously had eliminated plastic straws from its ships.